Need a break from all the sappy Christmas music that is no doubt following you around everywhere you go these days as you prepare for the magic of Christmas while draining your savings account? Search no further - Max Headroom is back to bring you some retro joy. Remember him? If your a retro fan then you are aware of the odd phenomenon from the mid 80s that spawned a bit of a craze. With technology becoming a bigger part of our lives and video technology pushing new boundaries, the timing was perfect for the emergence of a fictional artificial intelligence doing his thing on a video screen. 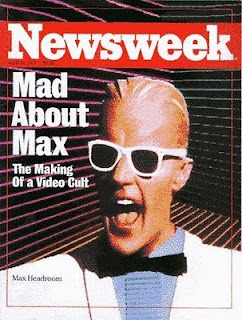 Max Headroom got his start as British TV series but became better known thanks to a video by Art of Noise that featured him performing for "Paranoimia". That led to a gig as a spokesman (spokesgraphic ? spokesimage ? spokesthingy ?) or talking head for New Coke that helped propel Max into the public conscienceness. Due to his popularity, Chrysalis released a Christmas song featuring Max singing "Merry Christmas Santa Claus" with his trademark stutter and quirky delivery.